Floods, the most common and hazardous natural event in Sri Lanka, are mainly caused by excessive rainfall received during monsoons resulting from development of low-pressure systems in the Bay of Bengal. From 2004 to 2014, Sri Lanka faced 23 flood occurrences with over 500 lives being lost and 9 million people affected. These floods caused an economic loss of USD 1 billion, reveals data available with International Water Management Institute (IWMI). With a large number of people being affected by floods every year, weather monitoring is a critical factor for Sri Lanka’s disaster management plan. Designed by IWMI scientist Yann Chemin, this open-source product will be made available online for anyone to use. 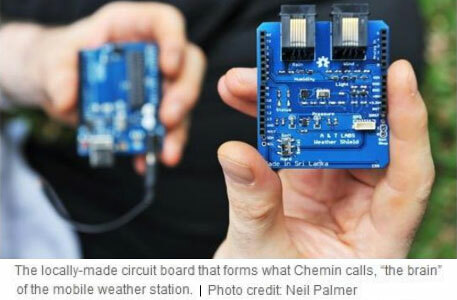 The designs are in the open domain because Chemin wants people to build their own weather stations and share improvements or refinements. We are currently experimenting with low cost Open Design, Open Source Hardware and Open Source Software integrative solutions for weather monitoring Chemin told Down To Earth (DTE). “What is essential is the ‘community of learning’ that we have created by making these designs open-source,” says the scientist. The latest New Mobile Weather Stations, as they are called (see pic), are equipped with an atomic clock to give precise time and date readings, and a GPS sensor, which updates automatically if they are moved. 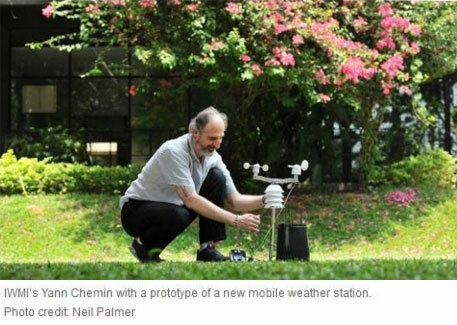 Chemin is developing a system for connecting such low-cost portable weather stations to Sri Lanks’s mobile phone network and transfer the data. He plans to send SMS alerts from these devices directly to farmers and government officials when rainfall levels are expected to rise in a specific area and help them plan for the worst. In the event of heavy rains, automated SMS alerts could be sent to people living in areas at risk of landslides. It would give the tank and reservoir managers advance warning to prepare for higher-than-usual flows of water into the tank system, so that they could react and release water elsewhere along the network to that the system doesn’t become overwhelmed and flood. 80% of the components can be produced in Sri Lanka. We have set up three weather stations so far in Sri Lanka, with two more in the pipeline, which will be customised for different water sector partners with targeted applications, says Chemin. According to IWMI news report, the fourth station will be tested by Meteorological Department of Sri Lanka at Colombo. IWMI will produce 10 more such devices in collaboration with the Lanka Rainwater Harvesting Forum. Rainfall availability is a very critical factor in dry zones of Sri Lanka. So Lanka Rainwater Harvesting Forum plans to use these devices in the country’s dry zone to improve rainwater harvesting in villages affected by CKDu (Chronic Kidney Disease of unknown etiology), which may be linked to drinking contaminated groundwater. According to a news report, in 20 years the disease has killed up to 20,000 people and sickened up to 400,000 more; some villages report it causes as many as 10 deaths a month. 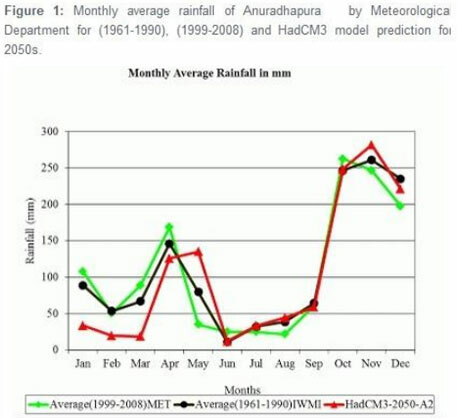 Climate change effects on northeast monsoonal rains in north, central and eastern regions of Sri Lanka is taking place at an accelerated pace and will have serious impacts on paddy cultivation as it depends on the northeast monsoon rainfall. Making available climate data in the public domain through this initiative is a significant step forward in meteorological monitoring, says Chemin. It should drive the discussions and debate on climate impacts, adaptation, especially in South Asia and Africa. Isn’t this a message that deserves to be on the agenda of global climate negotiations, especially the Paris Climate Conference (COP 21) scheduled to be held in December 2015? Assessing the impact of mHealth interventions in low- and middle-income countries – what has been shown to work?